Sarawak Energy’s 24/7 Customer Service Centre operates at two sites- Kuching and Miri to handle enquiries on technical and customer services. We have also increased our touch-points to ensure that the customers are able to reach us via various mediums. To make a new application for electricity supply, we advise you to hire a registered contractor, who will assist you with your application. You can also apply for new application for electricity supply online here. To terminate an existing account, you must surrender your original deposit. The registered customer must sign a Letter of Indemnity, affixed with Stamp Duty (RM10.00 per contract). In any other complex cases, or if the particulars do not match against the record, a Statutory Declaration is required. Any request on behalf of a registered owner who is deceased, a Statutory Declaration and Letter of Administration must be provided. You are required to change the name on the contract as soon as you buy or rent the premises. You are also required to settle any outstanding bills. For premises that have been vacant for more than one year, you are required to do an internal wiring testing. You may engage any of our registered internal wiring contractors to administer the testing. Please walk in to a Customer Service Counter, or contact our Customer Care Centre, to request for a disconnection. The request form can only be signed by the registered customer. The premises must be vacant. You must provide safe access to the meter so that our technician can obtain the last meter reading and inspect the meter before disconnection. The customer or a representative must be on site during disconnection. You are advised to set an appointment for the disconnection. You can request for a reconnection at a Customer Service Counter, or by contacting our Customer Care Centre. To request for a reconnection, payment for any outstanding bills must be made before 3pm on that day, and proof of payment must be provided if the payment was not made at the Customer Service Counter. 1. Temporary premises such as site offices, showrooms, or show houses, where electricity is required to operate and there is no permanent connection to the premises. 2. Permanent premises such as large commercial centres, high-rise buildings (offices, hotels, condominiums, etc.) and housing developments, for the purposes of inspection and testing of internal wiring—not for commercial operation. In this case, the application procedure is the same as with a normal application; customers must submit their Application Form (AC01) through SESCO-registered Electrical Installation Contractors (EIC) or Electrical Consultants, and attach required supporting documents to SESCO. Please refer to the checklist of standard required supporting documents. The temporary supply application does not require the submission of an Occupation Permit (OP) or any letter of consent from Councils. Temporary supply will be given after internal wiring testing results are submitted to and accepted by SESCO. All relevant charges such as Connection Charge and Collateral Deposit must be pair prior to meter installation. The meter is installed to measure the electricity consumption. Customers will receive monthly energy bills as usual. The 'Contract for Supply of Electricity' must be signed by the customer and by SESCO. The contract validity period, as well as the duration of temporary supply, will follow these conditions: a. Maximum 3 years for site office or temporary structure. b. Maximum 1 year for showroom or show house. The customer must sign an 'Undertaking Letter for Temporary Electricity Supply' to agree that, should the Council make a later decision that the temporary premises are illegal, the signed 'Contract for Supply of Electricity' shall be null and void, and the temporary supply will be disconnected. To apply for temporary supply to permanent buildings for internal wiring inspection and testing, SESCO-registered Electrical Installation Contractors (EIC) or Electrical Consultants must sign and submit the 'Undertaking Letter for Temporary Supply for Internal Wiring Installation Testing' (Form CCS/A20) to SESCO. The application does not require the submission of an Occupation Permit (OP) or any letter of consent from Counsils. All other relevant requirements and charges must be duly completed and paid prior to energizing or connecting the electricity supply. The duration of temporary supply for internal wiring inspection and testing purposes is defaulted to 1 month from the date of energization of electricity supply. During this period, contractors will have ample time to carry out site inspection with local authorities, utility agencies, and Jabatan Bomba—in order to obtain an Occupation Permit for the premises. A meter will be installed to measure electricity consumption during the given period of temporary supply. If you wish to conduct Internal Wiring Testing on your premises, please contact any of our authorised-to-test, registered Internal Wiring Contractors. Please contact our Customer Care Centre or walk-in to one of our Customer Service Counters to request for a meter testing. The contract account number will be required. If the meter is accurate, a meter testing fee of RM10.00 will be charged. Click on the individual region tabs to expand the table. This list was last updated on 1st November 2018. Collateral Deposit charges are standardised to a flat rate based on the type of premises, type of meter, and type of ownership of the premises. View the Collateral Deposit Rates table here. For Collateral Deposits below RM5,000, payment shall be made in cash or credit. 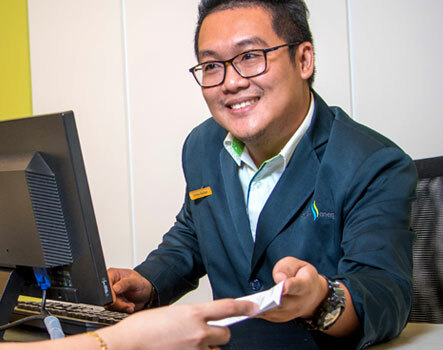 For Collateral Deposits that exceed RM5,000, customers may opt to provide security in the form of a banker's guarantee. The name stated in the NRIC must match with the registered customer's name in the SAP. For accounts registered under a company's name, an employee must sign on behalf of the company and present his/her NRIC. For each request, a photocopy of the NRIC must be submitted together with either a contact number or a postal address. Letter of Administration (LOA) if the registered customer is deceased; produced by the representative. A LOA must be produced by a representative, for legal beneficiary verification. Customer Service Counter staff must ensure that the relevant premises are stated clearly in the LOA. The registered customer is deceased and the LOA is not available. The registered customer's details (such as name or NRIC number) registered in the SAP do not match the details in his/her NRIC. This must be duly completed and signed by new customers who wish to retain and use the existing meters. If the customer wishes to submit a claim that the meter has been lost, burnt or damaged, a police report must be obtained to support the claim. A Connection Charge is the amount due to be paid by a customer who requires a new connection or an increase in electricity supply. A Connection Charge is applied to all overhead and underground network systems. Validity period is 6 months. (In view of the longer validity period, the 10% contingency for government projects shall no longer apply). Connection Charges (Capital Contribution) are calculated by: Capacity Charge + Low Tension Charge. The charge is applicable where the HT Actual Cost does not exceed 300% of the Capacity Charge. Connection Charge applies to developments that require no more than 1,000m of High Tension (HT) underground cable or 20 pole-spans of HT overhead line to connect to the nearest point of connection (decided by SESCO based on current planning criteria). All Connection Charge bills have to be paid on or before the date stated on the bill; failing which, the amount is subject to revision with interest charges thereon. All overdue Connection Charge bills are not acceptable for payment. The customer must surrender the overdue bill to the Developer/Contractor and/or Consultant. The Developer/Contractor and/or Consultant have to recalculate the Connection Charge. The amount may vary depending on the cost of the material on the day of calculation.